Unconquered | Painted Ponies Everyday Figurines | One Price Low Flat Shipping! From the Trail of Painted Ponies Summer 2016 Collection, Unconquered. Made of stone resin. Measures 9.5" tall. Designed by acclaimed equine artist, Kathleen Moody. 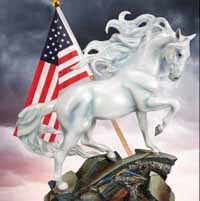 A tribute to the indomitable American spirit in the face of adversity, this noble white stallion is depicted proudly atop rubble from the 9-11 terrorist attack on the World Trade Center, soon to be fifteen years ago. This special triumphant patriotic horse figurine, standing radiantly with its mane and tail blowing in the wind, symbolizes the strength, pride, and resilience of America.